With light colors, subtle contrasts and clear typography, Origami personifies simplicity. Origami’s clean, uncluttered design will help your content stand out and leave a lasting impression. Origami’s clean and minimal design focuses your reader’s attention squarely on your content. There are several post formats to choose from when deciding how best to display your beautiful content. Origami’s simple options offer you the ability to customise your site. Thanks to them you can add a logo, change text in places like the footer or 404 page and choose to show or hide certain post elements like the blog author or featured image. Origami works hand-in-hand with our impressive Widgets Bundle - a diverse collection of widgets designed to help you unlock your content’s full potential. The media-focused options like the image slider and video widgets will set your content apart. Origami features our popular, intuitive, drag-and-drop Page Builder. 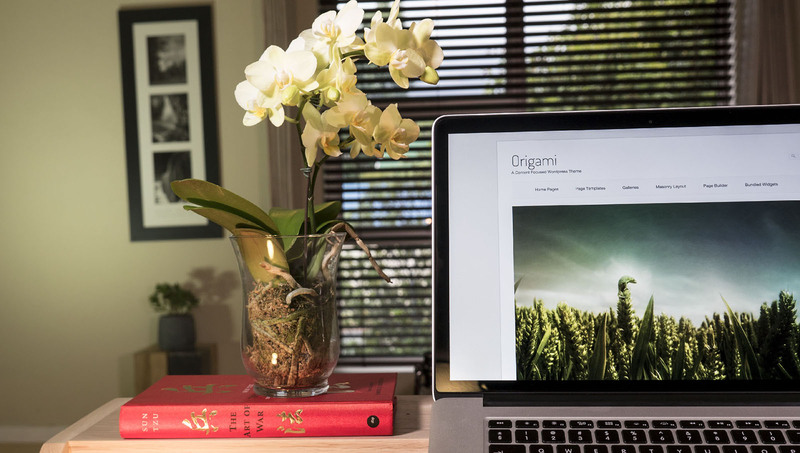 With Page Builder, Origami becomes far more than just a blogging theme. Page Builder enables you to create completely custom page-layouts filled with all your widgets. If you can dream it, you can craft it with page builder. Using SiteOrigin CSS editor - a powerful, visual CSS editor that allows you to refine your WordPress site's design in real-time - you’ll transform into an admired artisan. With simple visual controls and power features like code completion and real-time feedback, SiteOrigin CSS will turn you into a site editing pro in minimal time. Documentation is supplied with Origami and should this comprehensive documentation not help you perfect and refine your site, you can find support on SiteOrigin’s active community forums. Origami pays special attention to code quality. Every line of code is intentional, reviewed and held to the highest standards. This means that your site loads faster, is easier to work with and will be loved by search engines.